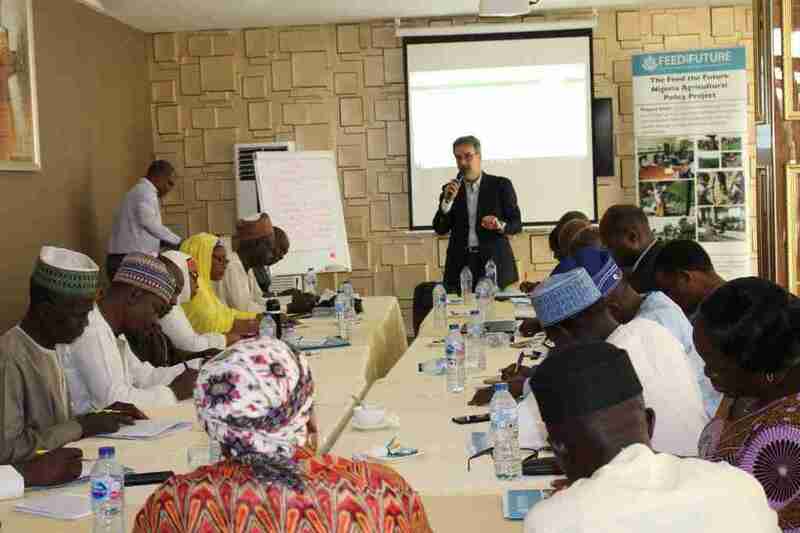 On 12-13 February 2019, the International Food Policy Research Institute (IFPRI) on behalf of the FtF Nigeria Agricultural Policy Project trained 23 (18 male, five female) senior staff (Assistant Director level) of the Federal Ministry of Agriculture and Rural Development in Abuja on Nigeria’s national and regional agricultural policy framework for the period spanning 2007 to the present. The training, which was facilitated by Dr. George Mavrotas, Head of IFPRI’s Nigeria Strategy Support Program (IFPRI-NSSP) and Hyacinth Edeh, a Research Analyst with IFPRI-NSSP, took participants on a journey across policies relevant to Nigeria’s agricultural sector, with an aim of providing participants with a better understanding of how these policies have shaped the role of agriculture in present-day Nigeria. 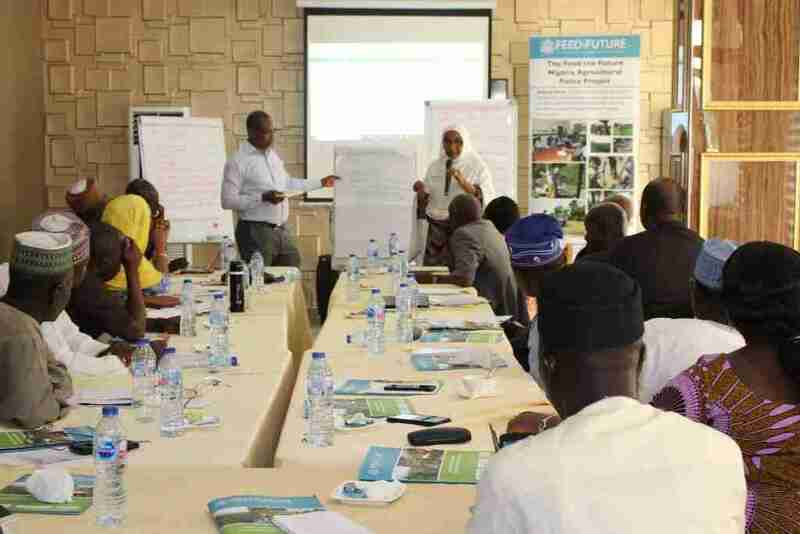 The training looked at the Agricultural Transformation Agenda, the Comprehensive Africa Agricultural Development Programme (CAADP) driven by the African Union, as well as the Agriculture Promotion Policy (APP) and the Economic Recovery and Growth Plan (ERGP) of the Muhammadu Buhari-led government, among others. Dr. Aisha Ndayako-Mohammed, Head of Projects Coordinating Unit at FMARD delivered welcome remarks at the training course and she also expressed her gratitude to the Project and the course organizers on behalf of FMARD following the completion of the course by saying: “ I attended a session of the training and felt the enthusiasm of the participants and the professionalism of IFPRI. However, a lot still has to happen from FMARD side to mainstream the lessons and recommendations from the training into the JSR activities. We will work on briefing management and articulate areas of support required. We sincerely appreciate the support from USAID and our continued partnership”. The course was enthusiastically received by all training participants. Dr. Rasaq, one of the participants from FMARD in the training course provided his feedback following the completion of the course: “I hereby wish to express my feedback on just concluded training workshop for Assistant Directors of FMARD covering APP, ERGP, CAADP, etc. I personally enjoy the content, package and mode of presentation of each of the themes. I interacted with my colleagues who equally expressed their satisfaction. The opportunity afforded us to access many other research papers and materials of IFPRI is salutary. I am better prepared to apply some of the lessons and take-away in my official day to day tasks and assignments. We equally appreciate the sponsor, USAID for their interventions in Nigeria Agriculture. USAID is first among the Donors in pursuing a program of alignment with FMARD aimed at better use of resources, value for money and great impacts on farmers’ livelihood and national food and nutrition security. The innovative training course was part of the activities of the Feed the Future Nigeria Agricultural Policy Project specifically aimed at further enhancing the capacity of Nigeria’s policy analysts to produce and make widely available evidence that is required for sound decision-making on agricultural policy. 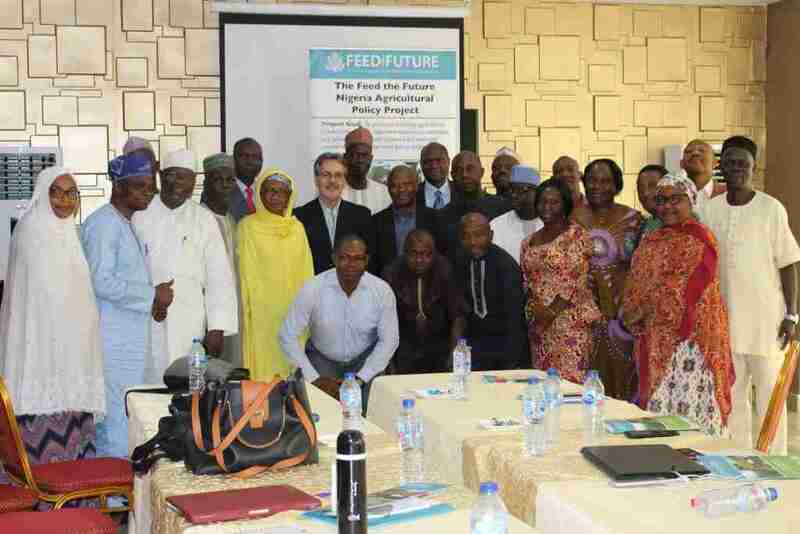 The Feed the Future Nigeria Agricultural Policy Project is funded by the United States Agency for International Development (USAID/Nigeria) and is jointly implemented by Michigan State University and IFPRI-NSSP.